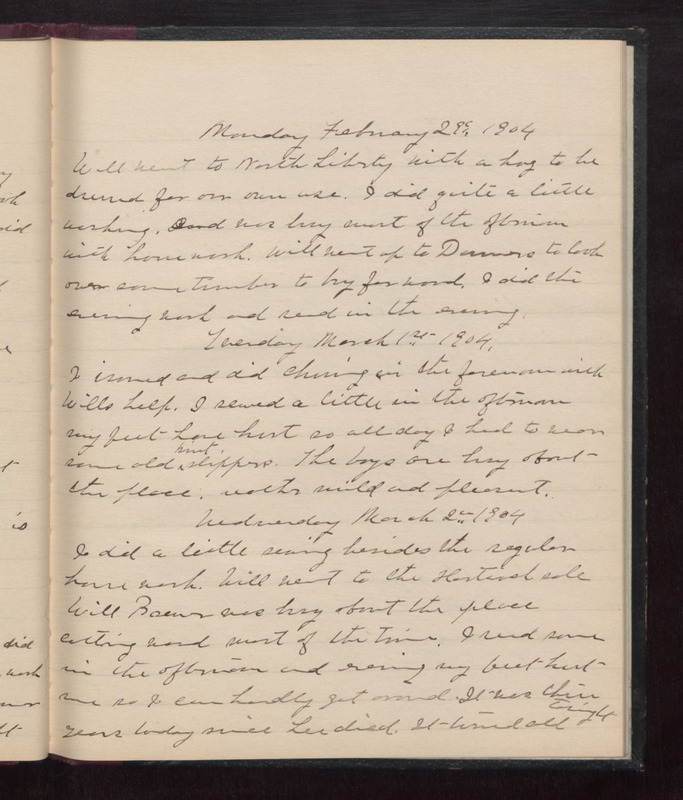 Monday February 29th 1904 Will went to North Liberty with a hog to be dressed for our own use. I did quite a little washing and was busy most of the afternoon with house work. Will went up to Danvers to look over some timber to try for wood. I did the evening work and read in the evening. Tuesday March 1st 1904 I ironed and did churning in the forenoon with Wills help. I sewed a little in the afternoon. My feet have hurt so all day I had to wear some old knit slippers. The boys are busy about the place. weather mild and pleasant. Wednesday March 2nd 1904 I did a little sewing besides the regular house work. Will went to the Hartsock sale Will Brewer was busy about the place cutting wood most of the time. I read some in the afternoon and evening my feet hurt me so I can hardly get around. It was three years today since Lee died. It turned cold tonight.